The aggregate market value of the registrant's voting stock held by nonaffiliates was approximately $1,344 million (based upon the closing price of the Common Stock at November 30, 2017 as reported on the New York Stock Exchange). On June 29, 2018, there were 34,740,330 shares of Common Stock outstanding. Portions of the Company's proxy statement for the Company's 2018 Annual Meeting of Stockholders, to be held October 10, 2018, are incorporated by reference in Part III of this report. AAR CORP. and its subsidiaries are referred to herein collectively as "AAR," "Company," "we," "us," and "our" unless the context indicates otherwise. AAR was founded in 1951, organized in 1955 and reincorporated in Delaware in 1966. We are a diversified provider of products and services to the worldwide aviation and government and defense markets. Beginning in fiscal 2015, we implemented a comprehensive strategic plan to narrow our strategy to focus on our best-in-class aviation and expeditionary services through our two business segments: Aviation Services and Expeditionary Services. We sold our Telair Cargo Group for cash of $714 million, resulting in pre-tax gains of $198.6 million in the fourth quarter of fiscal 2015 (and $27.7 million in the first quarter of fiscal 2016 from the receipt of contingent consideration). We used the proceeds from the sale in fiscal 2015 to reduce our total debt and return capital to shareholders through common stock repurchases and dividends. Through execution of our strategic plan over the last three years, we have succeeded in expanding customer relationships and securing new flight hour component inventory management and repair programs work with multiple international commercial customers and government customers. We also invested in our rotable assets to support these programs and continued our focus on expanding our business development resources. These investments in our supply chain activities have allowed us to increase market share, expand our customer base, and enlarge our geographic footprint. In fiscal 2018, we began the ramp-up for the 15-year, U.S. Air Force Landing Gear Performance-Based Logistics One program. Under the program, we are providing total supply chain management including purchasing, distribution and inventory control to support all landing gear components for the U.S. Air Force's fleet of C-130, KC-135 and E-3 aircraft. In fiscal 2018, we also began providing services to the U.S. Department of State ("DoS") under the INL/A Worldwide Aviation Support Services ("WASS") contract. This contract leverages our capabilities in aviation services, including flight operations, supply chain logistics, and other services. We are the prime contractor on this 10-year performance-based contract to globally operate and maintain the DoS fleet of fixed and rotary-wing aircraft. We successfully completed the transition and phase-in of the WASS program in June 2018. We have full operational capability at all contract sites, which include Afghanistan, Iraq, Panama, Peru, and Patrick Air Force Base as well as support locations in Brevard County, Florida. Our long-term strategy continues to emphasize the return of capital to shareholders. Over the past three years, we have returned $82.6 million to shareholders through common stock repurchases of $51.7 million and dividends of $30.9 million. We remain in a strong financial position to further execute on our strategy in fiscal 2019. Both our commercial and government businesses are executing on our many contract wins and will continue to deliver growth in fiscal 2019. Our cash on hand plus unused capacities on our Revolving Credit Facility and accounts receivable financing program was $473 million at May 31, 2018. We expect to invest opportunistically in expanding our comprehensive suite of services to the global commercial aviation and government and defense markets. We continue to have the flexibility in our balance sheet allowing us to invest in our growth. As we generate positive cash flow, we will continue our strategy of returning capital to our shareholders without hampering our future operating flexibility. The Aviation Services segment provides aftermarket support and services for the commercial aviation and government and defense markets and accounted for 93% of our sales in fiscal 2018, 2017, and 2016. In this segment, we also provide inventory management and distribution services, maintenance, repair and overhaul ("MRO"), and engineering services. Business activities in this segment are primarily conducted through AAR Supply Chain, Inc.; AAR Government Services, Inc.; AAR Aircraft & Engine Sales & Leasing, Inc.; AAR Aircraft Services, Inc.; AAR Allen Services, Inc.; AAR Landing Gear LLC; and AAR International, Inc.
We sell and lease a wide variety of new, overhauled and repaired engine and airframe parts and components and aircraft to our commercial aviation and government/defense customers. We provide customized flight hour component inventory and repair programs, warranty claim management, and outsourcing programs for engine and airframe parts and components in support of our airline and government customers' maintenance activities. The types of services provided under these programs include material planning, sourcing, logistics, information and program management, and parts and component repair and overhaul. We are also an authorized distributor for more than 70 product lines across over 25 leading aviation product manufacturers. We also provide customized performance-based supply chain logistics programs in support of the U.S. Department of Defense ("DoD") and foreign governments. The types of services provided under these programs include material planning, sourcing, logistics, information and program management, airframe maintenance and maintenance planning, and component repair and overhaul. We provide major airframe inspection, maintenance, repair and overhaul, painting services, line maintenance, airframe modifications, structural repairs, avionic service and installation, exterior and interior refurbishment, and engineering services and support for many types of commercial and military aircraft. We also repair and overhaul various components, landing gears, wheels, and brakes for commercial and military aircraft. We operate seven airframe maintenance facilities and one landing gear overhaul facility. Our landing gear overhaul facility is in Miami, Florida, where we repair and overhaul landing gear, wheels, brakes, and actuators for different types of commercial and military aircraft. Our U.S. airframe maintenance facilities are in Indianapolis, Indiana; Oklahoma City, Oklahoma; Duluth, Minnesota; Miami, Florida; and Rockford, Illinois and our Canadian airframe maintenance facilities are in Trois Rivieres, Quebec and Windsor, Ontario. In addition, we also announced a joint venture with Indamer Aviation which will develop and operate an airframe maintenance facility in India. The facility is currently under construction and is expected to begin operations in fiscal 2019. The majority of our product sales are made pursuant to standard commercial purchase orders. Government sales are generally made under standard types of government contracts which can include firm fixed-price contracts, cost plus fixed fee contracts, and time-and-materials contracts. Some of our contracts call for the performance of specified services or the delivery of specified products under indefinite delivery/indefinite quantity ("ID/IQ") arrangements. Certain inventory supply and management and performance-based logistics program agreements reflect negotiated terms and conditions. duration, price, and delivery. From time to time, we purchase engines for disassembly into individual parts and components. These engines may be leased to airlines on a short-term basis prior to disassembly. The Expeditionary Services segment consists of businesses that primarily provide products and services supporting the movement of equipment and personnel by the U.S. and foreign governments and non-governmental organizations. The Expeditionary Services segment accounted for 7% of our sales in fiscal 2018, 2017, and 2016. Business activities in this segment are primarily conducted through AAR Airlift Group, Inc.; AAR Manufacturing, Inc. and Brown International Corporation. We provide fleet management and operations of customer-owned aircraft for the DoS under the INL/A WASS contract. We are the prime contractor on this ten-year performance-based contract to globally operate and maintain the DoS fleet of fixed- and rotary-wing aircraft. We also design, manufacture, and repair transportation pallets and a wide variety of containers and shelters used in support of military and humanitarian tactical deployment activities. The containers and shelters are used in numerous mission requirements, including armories, supply and parts storage, refrigeration systems, tactical operation centers, briefing rooms, laundry and kitchen facilities, water treatment, and sleeping quarters. Shelters include both stationary and vehicle-mounted applications. We also provide engineering, design, and system integration services for specialized command and control systems and design and manufacture advanced composite materials for commercial, business and military aircraft. Sales in this segment are generally made to customers pursuant to standard commercial purchase orders and contracts. Government sales are generally made under standard types of government contracts which can include firm fixed-price contracts, cost plus fixed fee contracts, and time-and-materials contracts. Some of our contracts call for the performance of specified services or the delivery of specified products under ID/IQ arrangements, however, the majority of our products and services are procured via definite contracts. Although we generated 60% of our fiscal 2018 sales from the sale of products, our businesses are generally engaged in limited manufacturing activities and have minimal exposure to fluctuations in both the availability and pricing of raw materials. We purchase raw materials for our manufacturing operations, including steel, aluminum, extrusions, balsa, and other necessary supplies from several vendors. Where necessary, we have been able to obtain raw materials and other inventory items from numerous sources for each segment at competitive prices, terms, and conditions, and we expect to be able to continue to do so. We generally sell our products and services under standard 30-day payment terms. On occasion, certain customers, principally foreign customers, will negotiate extended payment terms of 60-90 days. Except for customary warranty provisions, customers neither have the right to return products nor do they have the right to extended financing. Our government contracts may extend several years and include one or more base years and one or more option years. The government generally has the right not to exercise options to extend or expand our contracts and may otherwise terminate, cancel, or modify some contracts at its convenience. business and general aviation operators, OEMs, aircraft leasing companies, aftermarket aviation support companies, the DoD and its contractors, and foreign military organizations or governments. In the Expeditionary Services segment, our principal customers include the DoS, DoD and its contractors, foreign military organizations or governments, defense organizations, and OEMs. Sales of aviation products and services to our commercial airline customers are generally affected by such factors as the number, type and average age of aircraft in service, the levels of aircraft utilization (e.g., frequency of schedules), the number of airline operators, the general economy, and the level of sales of new and used aircraft. Sales to the DoD and other government agencies are subject to a number of factors, including the level of troop deployment worldwide, government funding, competitive bidding, and requirements generated by worldwide geopolitical events. We primarily market and sell products and services through our own employees. In certain markets outside of the United States, we rely on foreign sales representatives to assist in the sale of our products and services. Sales to global government and defense customers (including sales to branches, agencies, and departments of the U.S. government) were $428.8 million (24.5% of consolidated sales), $438.7 million (27.6% of consolidated sales) and $489.4 million (32.1% of consolidated sales) in fiscal 2018, 2017 and 2016, respectively. Sales to branches, agencies, and departments of the U.S. government and their contractors were $304.3 million (17.4% of consolidated sales), $321.5 million (20.2% of consolidated sales), and $366.1 million (24.0% of consolidated sales) in fiscal 2018, 2017, and 2016, respectively. Sales to government and defense customers are reported in each of our reportable segments (See Note 13 of Notes to Consolidated Financial Statements). Since such sales are subject to competitive bidding and government funding, no assurance can be given that such sales will continue at levels previously experienced. The majority of our U.S. government sales are for products and services supporting the DoD logistics and mobility strategy. Thus, our government contracts have changed, and may continue to change, with fluctuations in defense and other governmental agency spending. Our government contracts are also subject to termination by the customer; in the event of such a termination, we are entitled to recover all allowable costs incurred by us through the date of termination. The Federal Aviation Administration ("FAA") regulates the manufacture, repair, and operation of all aircraft and aircraft parts operated in the United States. Similar rules and regulatory authorities exist in other countries. The inspection, maintenance and repair procedures for the various types of aircraft and equipment are prescribed by these regulatory authorities and can be performed only by certified repair facilities utilizing certified technicians. The FAA requires that various maintenance routines be performed on aircraft engines, certain engine parts, and airframes at regular intervals based on take off and landing cycles or flight time. Our businesses which sell defense products and services directly to the U.S. government or through its contractors can be subject to various laws and regulations governing pricing and other factors. repair stations are in the Aviation Services segment. We also hold a FAR Part 135 certificate to operate aircraft for our expeditionary airlift services business. We are also Commercial Airlift Review Board certified with the DoD. We believe that we possess all licenses and certifications that are material to the conduct of our business. Competition in each of our markets is based on quality, ability to provide a broad range of products and services, speed of delivery, and price. Competitors in our Aviation Services segment include OEMs, the service divisions of large commercial airlines, and other independent suppliers of parts, repair, and overhaul services to the commercial and defense markets. Our Expeditionary Services segment competes with domestic and foreign contracting companies and a number of divisions of large corporations and other large and small companies. Although certain of our competitors have substantially greater financial and other resources than we do, we believe that we have maintained a satisfactory competitive position through our responsiveness to customer needs, our attention to quality, and our unique combination of market expertise and technical and financial capabilities. Backlog represents the amount of revenue that we expect to derive from unshipped orders or signed contracts. At May 31, 2018, backlog was approximately $1,053 million compared to $519 million at May 31, 2017 which reflects the significant new commercial and government contract awards received over the last twelve months. Approximately $510 million of our May 31, 2018 backlog is expected to be filled in fiscal 2019. At May 31, 2018, we employed approximately 5,000 employees worldwide, of which approximately 155 employees are subject to a collective bargaining agreement. We also retain approximately 775 contract workers, the majority of whom are located at our airframe maintenance facilities. For additional information concerning our business segments, see Item 7, "Management's Discussion and Analysis of Financial Condition and Results of Operations" and "Business Segment Information" in Note 13 of Notes to Consolidated Financial Statements under Item 8, "Financial Statements and Supplementary Data." Our internet address is www.aarcorp.com. We make available free of charge through our web site our annual report on Form 10-K, quarterly reports on Form 10-Q, current reports on Form 8-K, and all amendments to those reports filed or furnished pursuant to Section 13(a) or 15(d) of the Securities Exchange Act of 1934 as soon as reasonably practicable after we electronically file such material with, or furnish such material to, the Securities and Exchange Commission. Information contained on our web site is not a part of this report. The following is a description of the principal risks inherent in our business. We are affected by factors that adversely impact the commercial aviation industry. As a provider of products and services to the commercial aviation industry, we are greatly affected by overall economic conditions of that industry. The commercial aviation industry is historically cyclical and has been negatively affected in the past by geopolitical events, high fuel and oil prices, lack of capital, and weak economic conditions. As a result of these and other events, from time to time certain of our customers have filed for bankruptcy protection or ceased operation. The impact of instability in the global financial markets may lead airlines to reduce domestic or international capacity. In addition, certain of our airline customers have in the past been impacted by tight credit markets, which limited their ability to buy parts, services, engines, and aircraft. A reduction in the operating fleet of aircraft both in the U.S. and abroad will result in reduced demand for parts support and maintenance activities for the type of aircraft affected. Further, tight credit conditions negatively impact the amount of liquidity available to buy parts, services, engines, and aircraft. A deteriorating airline environment may also result in additional airline bankruptcies, and in such circumstances we may not be able to fully collect outstanding accounts receivable. Reduced demand from customers caused by weak economic conditions, including tight credit conditions and customer bankruptcies, may adversely impact our financial condition or results of operations. Our U.S. government contracts may not continue at present sales levels, which may have a material adverse effect on our financial condition and results of operations. factors, including the level of troop deployment worldwide, competitive bidding, U.S. government funding, requirements generated by world events, and budgetary constraints. U.S. government programs are subject to annual congressional budget authorization and appropriation processes. In recent years, U.S. government appropriations have been affected by larger U.S. government budgetary issues and related legislation, including the statutory limit on the amount of permissible federal debt (the "debt ceiling"). These issues could negatively affect the timely collection of our U.S. government invoices. Future congressional appropriation and authorization of defense spending and the application of sequestration remain marked by significant debate and an uncertain schedule. The federal debt limit continues to be actively debated as plans for long-term national fiscal policy are discussed. The outcome of these debates could have a significant impact on defense spending broadly and programs we support in particular. If there are funding delays and constraints, we may be required to continue to perform for some period of time on certain of our U.S. government contracts even if the U.S. government is unable to make timely payments. Future budget cuts, including cuts mandated by sequestration, or future procurement decisions could result in reductions, cancellations, and/or delays of existing contracts or programs which could adversely affect our results of operations and financial condition. We face risks of cost overruns and losses on fixed-price contracts. We sell certain of our products and services to our commercial, government, and defense customers under firm contracts providing for fixed unit prices, regardless of costs incurred by us. The cost of producing products or providing services may be adversely affected by increases in the cost of labor, materials, fuel, overhead, and other unknown variants, including manufacturing and other operational inefficiencies and differences between assumptions used by us to price a contract and actual results. Increased costs may result in cost overruns and losses on such contracts, which could adversely affect our results of operations and financial condition. Success at our airframe maintenance facilities is dependent upon continued outsourcing by the airlines. We currently perform airframe maintenance, repair and overhaul activities at seven leased locations. Revenues at these facilities fluctuate based on demand for maintenance which, in turn, is driven by the number of aircraft operating and the extent of outsourcing of maintenance activities by airlines. In addition, certain airlines operate certain new fleet types and/or newer generation aircraft and we may not have contractual arrangements to service these aircraft nor technicians trained and certified to perform the required airframe maintenance, repair and overhaul activities. If either the number of aircraft operating or the level of outsourcing of maintenance activities declines, we may not be able to execute our operational and financial plans at our maintenance, repair and overhaul facilities, which could adversely affect our results of operations and financial condition. We operate in highly competitive markets, and competitive pressures may adversely affect us. ability to compete depends on superior customer service and support, on-time delivery, sufficient inventory availability, competitive pricing and effective quality assurance programs. Our government customers, including the DoD, may turn to commercial contractors, rather than traditional defense contractors, for certain work, or may utilize small business contractors or determine to source work internally rather than use us. We are also impacted by bid protests from unsuccessful bidders on new program awards. Bid protests could result in significant expense for us, contract modifications, or the award decision being overturned and loss of the contract award. Even where a bid protest does not result in the loss of an award, the resolution can extend the time until the contract activity can begin, and delay earnings. These competitive pressures, with potential impacts on both our commercial and government business, could adversely affect our results of operations and financial condition. We are subject to significant government regulation and may need to incur significant expenses to comply with new or more stringent governmental regulation. The aviation industry is highly regulated by the FAA in the United States and equivalent regulatory agencies in other countries. Before we sell any of our products that are to be installed in an aircraft, such as engines, engine parts and components, and airframe and accessory parts and components, they must meet certain standards of airworthiness established by the FAA or the equivalent regulatory agencies in certain other countries. We operate repair stations that are licensed by the FAA and the equivalent regulatory agencies in certain other countries, and hold certificates to operate aircraft. Specific regulations vary from country to country, although regulatory requirements in other countries are generally satisfied by compliance with FAA requirements. New and more stringent governmental regulations may be adopted in the future that, if enacted, may have an adverse impact on us. If any of our material licenses, certificates, authorizations, or approvals were revoked or suspended by the FAA or equivalent regulatory agencies in other countries, our results of operations and financial condition may be adversely affected. If we fail to comply with government procurement laws and regulations, we could lose business and be liable for various penalties or sanctions. We must comply with laws and regulations relating to the formation, administration, and performance of U.S. government contracts. These laws and regulations include the Federal Acquisition Regulations, Defense Federal Acquisition Regulations, the Truth in Negotiations Act, Cost Accounting Standards, and laws, regulations, and orders restricting the use and dissemination of classified information under the U.S. export control laws and the export of certain products and technical information and safeguarding of contractor information systems. Certain government contracts provide audit rights by government agencies, including with respect to performance, costs, business systems, internal controls and compliance with applicable laws and regulations. In complying with these laws and regulations, we may incur significant costs, and non-compliance may result in the imposition of fines and penalties, including contractual damages. If we fail to comply with these laws and regulations or if a government audit, review, or investigation uncovers improper or illegal activities, we may be subject to civil penalties, criminal penalties, or administrative sanctions, including suspension or debarment from contracting with the U.S. government. Our reputation could suffer harm if allegations of impropriety were made or found against us, which could adversely affect our operating performance and may result in additional expenses and possible loss of revenue. We are exposed to risks associated with operating internationally. changes in U.S. policies on trade relations and trade policy, including implementation of or changes in trade sanctions, tariffs, and embargoes. In addition, the UK held a referendum in 2016 in which voters approved an exit from the European Union ("EU"). On March 29, 2017, the UK government commenced the exit process under Article 50 of the Treaty of the EU by notifying the European Council of the UK's intention to leave the EU. This notification started a two-year time period for the UK and the remaining EU countries to negotiate a withdrawal agreement. The final terms of the UK's potential exit from the EU have yet to be determined and it is possible there will be greater restrictions on imports and exports between the UK and EU countries along with increased regulatory complexities. While we have adopted and will continue to adopt measures to reduce the potential impact of losses resulting from the risks of doing business internationally, such measures may not be adequate, and the regions in which we operate might not continue to be stable enough to allow us to operate profitably or at all. Acquisitions expose us to risks, including the risk that we may be unable to effectively integrate acquired businesses. We have completed multiple acquisitions over the past few years and we have discussions with third parties regarding acquisitions on a regular basis. Acquisitions involve risks, including difficulties in integrating the operations and personnel, the effects of amortization of any acquired intangible assets and the potential impairment of goodwill, and the potential loss of key employees of the acquired business. In addition, acquisitions often require substantial management resources and have the potential to divert our attention from our existing business. For any businesses we may acquire in the future, we may not be able to execute our operational, financial, or integration plans for the acquired businesses, which could adversely affect our results of operations and financial condition. Market values for our aviation products fluctuate and we may be unable to recover our costs incurred on engines, rotable components and other aircraft parts. We make a number of assumptions when determining the recoverability of rotable components, engines, and other assets which are on lease, available for lease, or supporting our long-term programs. These assumptions include historical sales trends, current and expected usage trends, replacement values, current and expected lease rates, residual values, future demand, and future cash flows. Reductions in demand for these assets or declining market values, as well as differences between actual results and the assumptions utilized by us when determining the recoverability of our aircraft, engines, and other assets could result in impairment charges in future periods, which would adversely affect our results of operations and financial condition. We may need to reduce the carrying value of our assets. We own and distribute a significant amount of engines, aircraft parts and components, and manufacturing facilities and related equipment. The removal of aircraft from service or recurring losses in certain operations could require us to evaluate the recoverability of the carrying value of those assets and record an impairment charge through earnings to reduce the carrying value. During the second quarter of fiscal 2018, we recognized impairment charges of $54.2 million related to assets included in our COCO business which is classified as a discontinued operation. In addition, if aircraft or engines for which we offer replacement parts or supply repair and overhaul services are retired and there are fewer aircraft that require these parts or services, our revenues may decline. We make a number of assumptions when determining the recoverability of our assets including historical sales trends, current and expected usage trends, replacement values, current and expected lease rates, residual values, future demand, and future cash flows. Differences between actual results and the assumptions utilized by us when determining the recoverability of our assets could result in impairment charges in future periods, which would adversely affect our results of operations and financial condition. We have recorded goodwill and other intangible assets related to acquisitions. If we are unable to achieve the projected levels of operating results, it may be necessary to record an impairment charge to reduce the carrying value of goodwill and related intangible assets. During the third quarter of fiscal 2018, we recognized a goodwill impairment charge of $9.8 million related to our COCO business. Similarly, if we were to lose a key customer or one of our airframe maintenance or landing gear facilities were to lose its authority to operate, we might be required to record an impairment charge. We are dependent upon continued availability of financing to manage our business and to execute our business strategy, and additional financing may not be available on terms acceptable to us. Our ability to manage our business and to execute our business strategy is dependent, in part, on the continued availability of debt and equity capital. Access to the debt and equity capital markets may be limited by various factors, including the condition of overall credit markets, general economic factors, state of the aviation industry, our financial performance, and credit ratings. Debt and equity capital may not continue to be available to us on favorable terms, or at all. Our inability to obtain financing on favorable terms could adversely affect our results of operations and financial condition. Our existing debt includes restrictive and financial covenants. failure to comply with these covenants could adversely affect our results of operations and financial condition. Our industry is susceptible to product and other liability claims, and claims not adequately covered by insurance may adversely affect our financial condition. Our business exposes us to possible claims for property damage and bodily injury or death which may result if an engine, engine part or component, airframe part or accessory, or any other aviation product which we have sold, manufactured, or repaired fails, or if an aircraft we operated, serviced, or in which our products are installed, crashes. We carry substantial liability insurance in amounts that we believe are adequate for our risk exposure and commensurate with industry norms. However, claims may arise in the future, and our insurance coverage may not be adequate to protect us in all circumstances. Additionally, we might not be able to maintain adequate insurance coverage in the future at an acceptable cost. Any liability claim not covered by adequate insurance could adversely affect our results of operations and financial condition. Our business could be negatively affected by cyber or other security threats or other disruptions. Our businesses depend heavily on information technology and computerized systems to communicate and operate effectively. The Company's systems and technologies, or those of third parties on which we rely, could fail or become unreliable due to equipment failures, software viruses, cyber threats, ransomware attacks, terrorist acts, natural disasters, power failures or other causes. These threats arise in some cases as a result of our role as a defense contractor. Cyber security threats are evolving and include, but are not limited to, malicious software, attempts to gain unauthorized access to our sensitive information, ransomware attacks, including our customers, suppliers, subcontractors, and joint venture partners, and other electronic security breaches that could lead to disruptions in mission critical systems, unauthorized release of confidential or otherwise protected information, and corruption of data. The procedures and controls we utilize to monitor and mitigate these threats may not be sufficient to prevent security threats from materializing. If any of these events were to materialize, the costs related to cyber or other security threats or disruptions may not be fully insured or indemnified and could have a material adverse effect on our reputation, operating results, and financial condition. Moreover, expenditures incurred in implementing and maintaining cyber security and other procedures and controls could adversely affect our results of operations and financial condition. We must comply with extensive environmental requirements, and any exposure to environmental liabilities may adversely affect us. Federal, state, and local requirements relating to the discharge and emission of substances into the environment, the disposal of hazardous wastes, the remediation and abatement of contaminants, and other activities affecting the environment have had and may continue to have an impact on our operations. Management cannot assess the possible effect of compliance with future environmental requirements or of future environmental claims for which we may not have adequate indemnification or insurance coverage. If we were required to pay the expenses related to any future environmental claims for which neither indemnification nor insurance coverage were available, these expenses could have an adverse impact on our results of operations and financial condition. governments, the International Civil Aviation Organization, or by signatory countries through a new global climate change treaty to regulate the emission of greenhouse gases by the aviation industry. The precise nature of any such requirements and their applicability to us and our customers are difficult to predict, but the impact to us and the aviation industry would likely be adverse and could be significant, including the potential for increased fuel costs, carbon taxes or fees, or a requirement to purchase carbon credits. We may need to make significant capital expenditures to keep pace with technological developments in our industry. The industries in which we participate are constantly undergoing development and change, and it is likely that new products, equipment, and methods of repair and overhaul services will be introduced in the future. We may need to make significant expenditures to purchase new equipment and to train our employees to keep pace with any new technological developments. These expenditures could adversely affect our results of operations and financial condition. Our operations would be adversely affected by a shortage of skilled personnel or work stoppages. We are dependent on an educated and highly skilled workforce because of the complex nature of many of our products and services. Furthermore, we have a collective bargaining agreement covering approximately 155 employees. Our ability to operate successfully and meet our customers' demands could be jeopardized if we are unable to attract and retain a sufficient number of skilled personnel, including qualified licensed mechanics, to conduct our business, or if we experience a significant or prolonged work stoppage. These and similar events may adversely affect our results of operations and financial condition. In the Aviation Services segment, we conduct parts supply activities from our headquarters in Wood Dale, Illinois, which we own. In addition to warehouse space, this facility includes executive, sales and administrative offices. Our principal maintenance, repair, overhaul, engineering and other service activities for this segment are conducted at U.S. facilities leased by us in Indianapolis, Indiana; Oklahoma City, Oklahoma; Miami, Florida; Duluth, Minnesota; and Rockford, Illinois and at Canadian facilities leased by us in Trois Rivieres, Quebec and Windsor, Ontario. We also lease facilities in Garden City, New York; Jacksonville, Florida; Brussels, Belgium; Singapore, Republic of Singapore; London, England; and Crawley, England, and own a building near Schiphol International Airport in the Netherlands to support activities in the Aviation Services segment. Our principal activities in the Expeditionary Services segment are conducted at facilities we lease in Melbourne, Florida; Huntsville, Alabama; and Sacramento, California and own in Cadillac, Michigan; Clearwater, Florida; and Goldsboro, North Carolina. We also operate sales offices which support all our activities and are leased in London, England; Crawley, England; Paris, France; Rio de Janeiro, Brazil; Shanghai, China; Singapore, Republic of Singapore; and Abu Dhabi, UAE. We believe that our owned and leased facilities are suitable and adequate for our operational requirements. On September 5, 2015, DynCorp International LLC ("DynCorp") filed a complaint in the United States District Court for the Middle District of Florida, Orlando Division (the "District Court"), accusing AAR Airlift Group, Inc. ("Airlift"), a wholly-owned subsidiary of AAR CORP., of misappropriation of DynCorp information, including trade secrets, and other related allegations, in connection with the submission of proposals in response to the solicitation issued by the U.S. Department of State ("DoS") Bureau of International Narcotics and Law Enforcement Affairs, Office of Aviation in support of the Worldwide Aviation Support Services program ("WASS"). On October 19, 2015, DynCorp filed an amended complaint with the District Court. On January 14, 2016, the District Court granted Airlift's motion to dismiss DynCorp's amended complaint. On February 2, 2016, DynCorp appealed the District Court's order to the United States Court of Appeals for the Eleventh Circuit (the "Eleventh Circuit"). On November 21, 2016, the Eleventh Circuit reversed in part the District Court's dismissal of the amended complaint and remanded the case to the District Court for further proceedings. On January 31, 2018, Airlift and DynCorp filed a joint notice of settlement, advising the District Court that they had reached an agreement in principle to resolve DynCorp's lawsuit and that they expected to file a stipulation of dismissal with prejudice within 14 days. On February 1, 2018, the District Court entered an order dismissing the DynCorp lawsuit without prejudice, subject to the right of any party within 60 days to move the court for the purpose of entering a stipulated form of a final order or judgment or, on good cause shown, to reopen the case for further proceedings. On June 20, 2018, the parties entered into a confidential settlement agreement to dismiss the lawsuit with prejudice without the payment of any money by either party. On June 26, 2018, the District Court entered an order dismissing the lawsuit with prejudice. On September 1, 2016, the DoS awarded the WASS contract to Airlift. On December 20, 2016, the U.S. Government Accountability Office ("GAO") denied a protest filed by DynCorp and confirmed the award of the WASS contract to Airlift. On December 28, 2016, DynCorp filed a further protest with the U.S. Court of Federal Claims ("COFC"). On October 31, 2017, the COFC denied DynCorp's protest. On November 20, 2017, DynCorp filed an emergency motion for interim relief pending appeal with the COFC. On December 13, 2017, the COFC issued an order denying DynCorp's motion. On November 14, 2017, DynCorp filed notice of appeal of the denial by the COFC of its protest to the U.S. Court of Appeals for the Federal Circuit (the "Court of Appeals"). On December 15, 2017, DynCorp filed a motion for injunction pending appeal with the Court of Appeals. On January 17, 2018, the Court of Appeals denied DynCorp's motion for injunction. The appeal on the merits before the Court of Appeals has been fully briefed by the parties, with no scheduled date for a decision. aircraft in Afghanistan and Africa, as well as several U.S. Navy contracts. In June 2018, the DoJ informed Airlift that part of the investigation was precipitated by a lawsuit filed under the qui tam provisions of the FCA by a former employee of Airlift. That lawsuit remains under seal. Airlift is cooperating with the DoJ investigation. Mr. Holmes is Chief Executive Officer and President, having served in that capacity since June 2018. From June 2017 to May 2018, Mr. Holmes served as President and Chief Operating Officer. From February 2015 to June 2017, Mr. Holmes served as Chief Operating OfficerAviation Services. Prior to that, Mr. Holmes served as Group Vice President, Aviation ServicesInventory Management and Distribution from 2012 to 2015, General Manager and Division President of our Allen Asset Management business from 2003 to 2012, and in various other positions since joining the Company in September 2001. Mr. Holmes has been a director of the Company since 2017. Mr. Milligan is Vice President and Chief Financial Officer, having served in that capacity since September 2017. Prior to joining AAR, he was Senior Vice President and Chief Financial Officer of NES Rentals Holdings, Inc. since 2005. Mr. Milligan was previously Executive Vice President and Chief Financial Officer of Telenisus Corporation from 1999 to 2001 and, prior thereto, was a partner with Pricewaterhouse Coopers LLP. Mr. Regan is Vice President, General Counsel and Secretary, having served in that capacity since June 2009. From 2008 to June 2009, Mr. Regan served as Vice President and General Counsel and, prior to that, Associate General Counsel since joining AAR in February 2008. Prior to joining AAR, he was a partner at the law firm of Schiff Hardin LLP since 1989. Mr. Pachapa is Vice President, Controller and Chief Accounting Officer, having served in that capacity since July 2016. Mr. Pachapa previously served as Controller since October 2015 and Senior Director of Accounting and Reporting since April 2014. Prior to joining the Company, he was with Glanbia plc from 2011 to 2014, and with Ernst & Young LLP from 1996 to 2011. Each executive officer is elected annually by the Board of Directors. Executive officers continue to hold office until their successors are duly elected or until their death, resignation, termination or reassignment. Our common stock is traded on the New York Stock Exchange and the Chicago Stock Exchange under the symbol "AIR." On June 29, 2018, there were approximately 900 holders of common stock, including participants in security position listings. 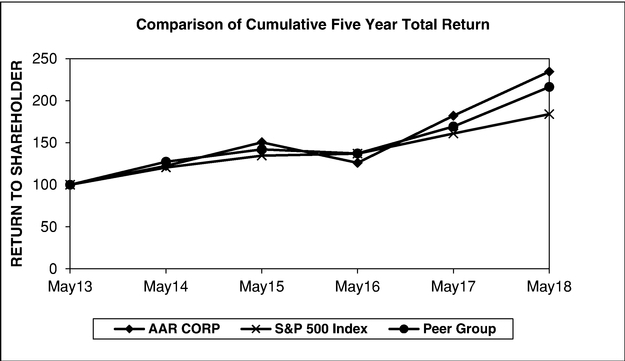 The following graph compares the total return on a cumulative basis of $100 invested, and reinvestment of dividends in our common stock on May 31, 2013 to the Standard and Poor's ("S&P") 500 Index and the Proxy Peer Group. Aerojet Rocketdyne Holdings, Inc. KLX Inc.
Barnes Group Inc. Moog Inc.
CACI International Inc Rockwell Collins, Inc.
Esterline Technologies Corporation Triumph Group, Inc.
Heico Corporation Wesco International, Inc. The Company annually revisits the composition of the peer group to ensure that the Company's performance is measured against those of comparably-sized and situated companies. The mix of the Company's commercial and defense businesses presents a challenge in constructing a peer group, given that many defense contractors have substantially greater resources than the Company. No changes were made to the composition of the peer group for fiscal 2018. We did not purchase any shares of our common stock during the quarter ended May 31, 2018. Our Board of Directors authorized a stock repurchase program on July 10, 2017 providing for the repurchase of up to $250 million of our common stock with no expiration date. The remaining number of shares available for repurchase under that authorization is $237 million. During the third quarter of fiscal 2018, we decided to pursue the sale of our Contractor-Owned, Contractor-Operated ("COCO") business previously included in our Expeditionary Services segment. The Results of Operations and Financial Position data has been recast to reflect the classification of our COCO business as a discontinued operation for all periods presented. operations. We also recognized impairment charges of $25.6 million related to our composite manufacturing operations. In fiscal 2015, we redeemed our $325 million 7.25% Senior Notes due 2022 for $370.6 million. We recognized a loss on extinguishment of debt of $44.9 million comprised of a make-whole premium of $45.6 million and unamortized deferred financing costs of $6.2 million, partially offset by an unamortized net premium of $6.9 million. In fiscal 2015, we sold our Telair Cargo Group for $725 million resulting in a $198.6 million pre-tax gain. We also recognized impairment charges of $31.9 million in fiscal 2015 to reduce the carrying value of our metal machining business's net assets to their expected value at the time of sale. In fiscal 2016, we received contingent consideration from the sale of Telair Cargo Group and recognized a pre-tax gain of $27.7 million. In fiscal 2018, we recognized asset impairment charges of $64.0 million related to our COCO business. On May 29, 2015, we repurchased 4,185,960 shares of our common stock at a price of $31.90 per share pursuant to a tender offer utilizing $133.5 million cash on hand. Fees and expenses of $1.2 million were incurred related to the tender offer and were recorded in treasury stock. Management's Discussion and Analysis of Financial Condition and Results of Operations contain certain statements relating to future results, which are forward-looking statements as that term is defined in the Private Securities Litigation Reform Act of 1995. These forward-looking statements are based on the beliefs of management, as well as assumptions and estimates based on information available to us as of the dates such assumptions and estimates are made, and are subject to certain risks and uncertainties that could cause actual results to differ materially from those anticipated, depending on a variety of factors, including those factors discussed under Item 1A, "Risk Factors." Should one or more of those risks or uncertainties materialize adversely, or should underlying assumptions or estimates prove incorrect, actual results may vary materially from those described. Those events and uncertainties are difficult or impossible to predict accurately and many are beyond our control. We assume no obligation to update any forward-looking statements to reflect events or circumstances after the date of such statements or to reflect the occurrence of anticipated or unanticipated events. We report our activities in two business segments: Aviation Services comprised of supply chain and maintenance, repair and overhaul ("MRO") activities and Expeditionary Services comprised of airlift and mobility activities. The Aviation Services segment consists of aftermarket support and services businesses that provide spares and maintenance support for aircraft operated by our commercial and government/defense customers. Sales in the Aviation Services segment are derived from the sale and lease of a wide variety of new, overhauled and repaired engine and airframe parts and components and aircraft to the commercial aviation and government and defense markets. We provide customized inventory supply chain management, performance based logistics programs, aircraft component repair management services, and aircraft modifications. The segment also includes MRO of aircraft, landing gear and components. Cost of sales consists principally of the cost of product, direct labor, and overhead. The Expeditionary Services segment consists of businesses that provide products and services supporting the movement of equipment and personnel by the U.S. and foreign governments and other non-governmental organizations. Sales in the Expeditionary Services segment are derived from fleet management and operations of customer-owned aircraft and the design and manufacture of pallets, shelters, and containers used to support the U.S. military's requirements for a mobile and agile force. We also design and manufacture advanced composite materials for commercial, business and military aircraft. Cost of sales consists principally of the cost of material to manufacture products, direct labor and overhead. Our chief operating decision making officer (Chief Executive Officer) evaluates performance based on the reportable segments and utilizes gross profit as a primary profitability measure. Gross profit is calculated by subtracting cost of sales from sales. The assets and certain expenses related to corporate activities are not allocated to the segments. Our reportable segments are aligned principally around differences in products and services. to reduce our total debt and return capital to shareholders through common stock repurchases and dividends. Consolidated sales for fiscal 2018 increased $157.5 million or 9.9% compared to the prior year primarily due to an increase in sales of $133.5 million or 9.0% in our Aviation Services segment. This increase was driven by strong growth in our aviation supply chain activities including our recent contract awards for component inventory management and repair programs for commercial and government customers. This growth was partially offset by the impact from the wind-down of our KC-10 program. Our principal services under the KC-10 program were completed in January 2017 with the wind-down completed in fiscal 2018. Sales for the KC-10 program during fiscal 2017 were $110.6 million compared to $29.1 million in fiscal 2018. Sales in the Expeditionary Services segment increased $24.0 million or 22.8% over the prior year primarily due to the start of our services on the WASS program on November 1, 2017. We remain in a strong financial position to further execute on our strategy in fiscal 2019. Both our commercial and government businesses are executing on our many contract wins and will continue to deliver growth in fiscal 2019. Our cash on hand plus unused capacities on our Revolving Credit Facility and accounts receivable financing program was $473 million at May 31, 2018. We expect to invest opportunistically in expanding our comprehensive suite of services to the global commercial aviation and government and defense markets. We continue to have the flexibility in our balance sheet to invest in our growth. As we generate positive cash flow, we will continue our strategy of returning capital to our shareholders without hampering our future operating flexibility and our growth plans. For fiscal 2019, we expect the Company's consolidated sales in the range of $2.1 to $2.2 billion. Diluted earnings per share from continuing operations for fiscal 2019 is expected to be in the range of $2.50 to $2.80. Sales in the Aviation Services segment increased $133.5 million or 9.0% over the prior year due to a $167.0 million or 15.0% increase in sales to commercial customers. The increase in sales to commercial customers was primarily attributable to higher volumes in aviation supply chain activities driven by new contract awards. During fiscal 2018, sales in this segment to government and defense customers decreased $33.5 million or 9.0% from the prior year. The decrease was primarily due to the wind-down of our KC-10 program. basis, we recognized favorable cumulative catch-up adjustments of $3.6 million and $8.5 million for fiscal 2018 and 2017, respectively. These adjustments primarily relate to our long-term, power-by-the-hour programs where we provide component inventory management and repair services. Cost of sales in Aviation Services increased $107.6 million or 8.7% over the prior year which was in line with the sales increase discussed above. Gross profit in the Aviation Services segment increased $25.9 million or 10.5% over the prior year. Gross profit on sales to commercial customers increased $20.7 million or 11.3% over the prior year primarily driven by the higher volumes in aviation supply chain activities. The gross profit margin on sales to commercial customers was 15.9% compared to 16.4% in the prior year and was largely attributable to labor challenges at our airframe maintenance hangars. Gross profit in this segment on sales to government and defense customers increased $5.2 million or 8.3% from the prior year primarily driven by improved profitability on new contract awards. The gross profit margin increased from 17.0% to 20.2% primarily due to these new contract awards. Sales in the Expeditionary Services segment increased $24.0 million or 22.8% over the prior year primarily due to the start of our services on the WASS program on November 1, 2017. Gross profit in the Expeditionary Services segment increased $5.3 million over the prior year due to the addition of the WASS program in fiscal 2018. Selling, general and administrative expenses increased $27.5 million in fiscal 2018 or 15.2% from the prior year primarily attributable to supporting our sales growth, including increased personnel-related costs and business development activities. Interest expense increased $2.7 million in fiscal 2018 over the prior year primarily as a result of higher borrowings and higher interest rates on our Revolving Credit Facility. We entered into a Credit Agreement with the Canadian Imperial Bank of Commerce, as lender (the "Credit Agreement") on October 18, 2017. The Credit Agreement provided a Canadian $31 million term loan with the proceeds used to fund the acquisition of two MRO facilities in Canada from Premier Aviation. On December 22, 2017, the President of the United States signed into law the Tax Cuts and Jobs Act (the "Tax Reform Act") which significantly reduced the corporate federal income tax rate to 21% from 35%. The income tax rate reduction in the Tax Reform Act results in a blended federal statutory tax rate for the Company of 29.2% in fiscal 2018 compared to 35.0% in fiscal 2017. Due to the reduction in our tax rate in fiscal 2018 and in future years, we re-measured our deferred tax assets and liabilities based on the tax rate at which they are expected to reverse in the future which resulted in an income tax benefit of $14.1 million in fiscal 2018. Effective June 1, 2017, we adopted Accounting Standards Update ("ASU") 2016-09 which requires excess tax benefits or deficiencies for restricted shares and stock options to be recognized as income tax expense or benefit in the period shares vest or options are exercised rather than within equity. We recognized $2.9 million of excess tax benefits as an income tax benefit during fiscal 2018.
of the net operating losses and other state deferred tax assets. The effective income tax rate for fiscal 2017 includes a benefit of $2.2 million related to recognition of previously unrecognized uncertain tax positions. During the third quarter of fiscal 2018, we decided to pursue the sale of our Contractor-Owned, Contractor-Operated business ("COCO") business previously included in our Expeditionary Services segment. Due to this strategic shift, the assets, liabilities, and results of operations of our COCO business have been reported as discontinued operations for all periods presented. Loss from discontinued operations was $58.1 million in fiscal 2018 compared to income of $4.5 million in the prior year. The decrease of $62.6 million was primarily due to goodwill and other asset impairment pre-tax charges of $65.2 million in fiscal 2018 and the completion of certain long-term customer contracts in the second quarter of fiscal 2018.
nmPercentage change is not meaningful. Sales in the Aviation Services segment increased $60.4 million or 4.2% over the prior year due to a $111.4 million or 11.1% increase in sales to commercial customers. The increase in sales to commercial customers was primarily attributable to higher volumes in aviation supply chain activities driven by new contract awards. During fiscal 2017, sales in this segment to government and defense customers decreased $51.0 million or 12.1% from the prior year. The decrease was primarily due to the wind-down of our KC-10 program. Changes in estimates and assumptions related to our programs accounted for using the percentage-of-completion method are recorded using the cumulative catch-up method of accounting. In fiscal 2017, we recognized favorable and unfavorable cumulative catch-up adjustments of $9.2 million and $0.7 million, respectively, compared to favorable and unfavorable cumulative catch-up adjustments of $6.1 million and $2.4 million, respectively, in fiscal 2016. When considering these adjustments on a net basis, we recognized favorable cumulative catch-up adjustments of $8.5 million and $3.7 million for fiscal 2017 and 2016, respectively. These adjustments primarily relate to our long-term, power-by-the-hour programs where we provide component inventory management and repair services. Cost of sales in Aviation Services increased $43.9 million or 3.7% over the prior year which was in line with the sales increase discussed above. Gross profit in the Aviation Services segment increased $16.5 million or 7.1% over the prior year. Gross profit on sales to commercial customers increased $25.9 million or 16.5% over the prior year primarily driven by the higher volumes in aviation supply chain activities. The gross profit margin on sales to commercial customers increased to 16.4% compared to 15.7% in the prior year and was largely attributable to strong profitability growth in aviation supply chain activities. Gross profit in this segment on sales to government and defense customers decreased $9.4 million or 13.0% from the prior year primarily driven by the reduced services under our KC-10 program. The gross profit margin decreased from 17.2% to 17.0% primarily due to these decreased volumes. Sales in the Expeditionary Services segment increased $5.0 million or 5.0% over the prior year primarily due to higher demand for our mobility products; however, these levels are still significantly below historical levels of performance for this business. Gross profit in the Expeditionary Services segment increased $13.8 million over the prior year due to improved profitability for mobility products. During the first quarter of fiscal 2017, we sold certain assets related to our temperature-controlled container product line to Sonoco Protective Solutions, Inc. which resulted in a gain of $2.6 million. Selling, general and administrative expenses increased $23.5 million in fiscal 2017 or 14.9% from the prior year primarily attributable to incremental investments in business development activities, including legal costs related to our defense of the INL/A WASS contract award. Interest expense decreased $1.1 million in fiscal 2017 from the prior year primarily as a result of the retirement of our remaining convertible notes in fiscal 2016. Our fiscal 2017 effective income tax rate for continuing operations was 32.6% compared to 34.0% in the prior year. The effective income tax rate for fiscal 2017 includes a benefit of $2.2 million related to recognition of previously unrecognized uncertain tax positions. The effective income tax rate for fiscal 2016 includes a benefit of $1.3 million related to the correction of prior year immaterial errors. At May 31, 2018, our liquidity and capital resources included cash of $31.1 million and working capital of $609.4 million. We maintain a Revolving Credit Facility with various financial institutions, as lenders and Bank of America, N.A., as administrative agent for the lenders which provides the Company an aggregate revolving credit commitment amount of $500 million. The Company, under certain circumstances, has the ability to request an increase to the revolving credit commitment by an aggregate amount of up to $250 million, not to exceed $750 million in total. Borrowings outstanding under the Revolving Credit Facility at May 31, 2018 were $130.0 million and there were approximately $16.7 million of outstanding letters of credit, which reduced the availability of this facility to $353.3 million. There are no other terms or covenants limiting the availability of this facility. We also had $9.9 million available under foreign lines of credit at May 31, 2018. On October 18, 2017, we entered into a Credit Agreement with the Canadian Imperial Bank of Commerce, as lender. The Credit Agreement provided a Canadian $31 million term loan with the proceeds used to fund the acquisition of two maintenance, repair, and overhaul facilities in Canada from Premier Aviation. The term loan is due in full at the expiration of the Credit Agreement on November 1, 2021 unless terminated earlier pursuant to the terms of the Credit Agreement. Interest is payable monthly on the term loan at the offered fluctuating Canadian Dollar Offer Rate plus 125 to 225 basis points based on certain financial measurements if a Bankers' Acceptances loan, or at the offered fluctuating Prime Rate plus 25 to 125 basis points based on certain financial measurements, if a Prime Rate loan. that they do not intend to extend the term. During fiscal 2018, we sold $239.6 million of receivables under the Purchase Agreement and remitted $167.9 million to the Purchaser on their behalf. As of May 31, 2018, we have collected cash of $10.5 million which has not yet been remitted to the Purchaser and has been classified as Restricted cash on our Consolidated Balance Sheet. At May 31, 2018, we complied with all financial and other covenants under each of our financing arrangements. Net cash provided from operating activitiescontinuing operations was $55.8 million in fiscal 2018 compared to a use of cash of $13.5 million in fiscal 2017. The increase of $69.3 million was primarily attributable to the new Purchase Agreement entered into during the third quarter of fiscal 2018 for the sale of certain accounts receivable. During fiscal 2018, we sold $239.6 million of receivables to the Purchaser and collected $178.4 million on behalf of the Purchaser. Net cash used in investing activitiescontinuing operations was $38.6 million in fiscal 2018 compared to $33.9 million in fiscal 2017. In fiscal 2018, we acquired the outstanding shares of two MRO facilities in Canada owned by Premier Aviation for approximately $24.8 million which included $22.9 million paid at closing. During fiscal 2017, we acquired the trading business of ACLAS Global Limited ("ACLAS") for $12.0 million paid at closing with $3.0 million in deferred consideration payable over the next three years. Net cash provided from financing activitiescontinuing operations was $11.7 million in fiscal 2018 compared to cash used of $10.4 million in fiscal 2017. The additional cash provided of $22.1 million was primarily attributable to proceeds from a new term loan of $24.8 million to finance the acquisition of the two Canadian MRO facilities previously discussed. Net cash used in operating activitiescontinuing operations was $13.5 million in fiscal 2017 compared to cash provided by operating activitiescontinuing operations of $46.0 million in fiscal 2016. The decrease of $59.5 million was primarily attributable to greater investments in rotable assets supporting long-term programs in fiscal 2017. These investments primarily support new government program awards such as the U.S. Navy's C-40A fleet as well as new flight hour component inventory management and repair programs with commercial airline customers including South African Airways, Air New Zealand, and other operators. Net cash used in investing activitiescontinuing operations was $33.9 million in fiscal 2017 compared to cash used of $43.8 million in fiscal 2016. The decrease of $9.9 million over the prior year was attributable to less capital expenditures in fiscal 2017. Net cash used in financing activitiescontinuing operations was $10.4 million in fiscal 2017 compared to $38.4 million in fiscal 2016. The reduction in cash used in financing activities of $28.0 million was primarily attributable to an increase in net borrowings in fiscal 2017 compared to the prior year. Interest associated with variable rate debt was determined using the interest rate in effect on May 31, 2018. Purchase obligations arise in the ordinary course of business and represent a binding commitment to acquire inventory, including raw materials, parts, and components, as well as equipment to support the operations of our business. We anticipate contributing approximately $2.9 million to our pension plans during fiscal 2019 compared to contributions of $8.4 million in fiscal 2018. Our additional contributions in fiscal 2018 were completed to provide the benefits of lower premiums incurred with the Pension Benefit Guaranty Corporation and an increased tax deduction in advance of the expected enactment of the Tax Reform Act. Required contributions for future years depend on factors that cannot be determined at this time. The above table excludes any tax liability payments, including any payments related to unrecognized tax benefits. We routinely issue letters of credit and performance bonds in the ordinary course of business. These instruments are typically issued in conjunction with insurance contracts or other business requirements. The total of these instruments outstanding at May 31, 2018 was $16.7 million. Our Consolidated Financial Statements are prepared in conformity with accounting principles generally accepted in the United States. Management has made estimates and assumptions relating to the reporting of assets and liabilities and the disclosure of contingent liabilities to prepare the Consolidated Financial Statements. The most significant estimates made by management include those related to assumptions used in assessing goodwill impairment, adjustments to reduce the value of inventories and certain rotable assets, revenue recognition, and assumptions used in determining pension plan obligations. Accordingly, actual results could differ materially from those estimates. The following is a summary of the accounting policies considered critical by management. Under accounting standards for goodwill and other intangible assets, goodwill and other intangible assets deemed to have indefinite lives are not amortized, but are subject to annual impairment tests. We review and evaluate our goodwill and indefinite life intangible assets for potential impairment at a minimum annually, on May 31, or more frequently if circumstances indicate that impairment is possible. The accounting standards for goodwill allow for either a qualitative or quantitative approach for the annual impairment test. Under the qualitative approach, factors such as macroeconomic conditions, industry and market conditions and company-specific events or circumstances are assessed to determine whether it is more likely than not that the fair value of a reporting unit is less than its carrying amount. For the quantitative approach, we compare the fair value of each reporting unit with the carrying value of the reporting unit, including goodwill. If the estimated fair value of the reporting unit is less than the carrying value of the reporting unit, we would be required to recognize an impairment loss for the excess carrying value of the reporting unit's assets. As of May 31, 2018, we have five reporting units as defined by Accounting Standards Codification ("ASC") 350, IntangiblesGoodwill and Other with only four of the reporting units' assigned goodwill. Our four reporting units with goodwill include two in our Aviation Services segment (Aviation Supply Chain and Maintenance, Repair, and Overhaul) and two in our Expeditionary Services segment (Airlift and Mobility). We performed an interim goodwill impairment test over our Airlift reporting unit as a result of a decision to exit our Contractor-Owned, Contractor-Operated ("COCO") business. The COCO business was reclassified to discontinued operations and goodwill was allocated to the COCO business based on its relative fair value to the reporting unit. The fair value of the reporting unit was determined based on a combination of the expected net proceeds upon sale and a discounted cash flow analysis. As the fair value of the COCO business was below its carrying value, a goodwill impairment charge of $9.8 million was recorded in the third quarter of fiscal 2018. For our annual impairment test as of May 31, 2018, we utilized the qualitative assessment approach for all reporting units. Under this approach, we considered the overall industry and market conditions related to the aerospace and government/defense markets as well as conditions in the global capital markets. We also considered the long-term forecasts for each reporting unit which incorporated specific opportunities and risks, working capital requirements, and capital expenditure needs. Upon completion of the annual qualitative analysis as of May 31, 2018 for our reporting units, we concluded it was more likely than not that the fair value of each reporting unit exceeded its carrying values, and thus no impairment charge was recorded. Inventories are valued at the lower of cost or market (estimated net realizable value). Cost is determined by the specific identification, average cost or first-in, first-out methods. Write-downs are made for excess and obsolete inventories and inventories that have been impaired as a result of industry conditions. We have utilized certain assumptions when determining the market value of inventories, such as inventory quantities and aging, historical sales of inventory, current and expected future aviation usage trends, replacement values, expected future demand, and historical scrap recovery rates. Reductions in demand for certain of our inventories or declining market values, as well as differences between actual results and the assumptions utilized by us when determining the market value of our inventories, could result in the recognition of impairment charges in future periods. Certain supply chain management programs that we provide to our customers contain multiple elements or deliverables, such as program and warehouse management, parts distribution and maintenance and repair services. We recognize revenue for each element or deliverable that can be identified as a separate unit of accounting at the time of delivery based upon the relative fair value of the products and services. Sales and related cost of sales for certain large airframe maintenance contracts and performance-based logistics programs are recognized using contract accounting under the percentage of completion method in accordance with ASC 605-35, ConstructionType and ProductionType Contracts. In applying the percentage of completion method, we use the cost-to-cost method based on the ratio of actual costs incurred to total estimated costs to be incurred. In connection with these contracts and programs, we are required to make certain judgments and estimates, including estimated revenues and costs, as well as inflation and the overall profitability of the program and the relative fair value of each element of the arrangement. Key assumptions involved in our contract accounting include future labor costs and efficiencies, overhead costs, and ultimate timing of product delivery. Differences may occur between the judgments and estimates made by management and actual program results. Changes in estimates and assumptions related to our programs accounted for using the percentage-of-completion method are recorded using the cumulative catch-up method of accounting. In fiscal 2018, we recognized favorable and unfavorable cumulative catch-up adjustments of $11.6 million and $8.0 million, respectively. When considering these adjustments on a net basis, we recognized net favorable cumulative catch-up adjustments of $3.6 million in fiscal 2018. These adjustments primarily relate to our long-term, power-by-the-hour programs where we provide component inventory management and repair services. We are required to test for impairment of long-lived assets whenever events or changes in circumstances indicate the carrying value of an asset may not be recoverable from its undiscounted cash flows. When applying accounting standards addressing impairment to long-lived assets, we have utilized certain assumptions to estimate future undiscounted cash flows, including current and future sales volumes or lease rates, expected changes to cost structures, lease terms, residual values, market conditions, and trends impacting future demand. Differences between actual results and the assumptions utilized by us when determining undiscounted cash flows could result in future impairments of long-lived assets. During the second quarter of fiscal 2018, we recognized impairment charges of $54.2 million related to assets included in our COCO business which is classified as a discontinued operation. We maintain a significant inventory of rotable parts and equipment to service customer aircraft and components. Portions of that inventory are used parts that are often exchanged with parts removed from aircraft or components, and are reworked to a useable condition. We may have to recognize an impairment of our rotable parts and equipment if we discontinue using or servicing certain aircraft models or if an older aircraft model is phased-out in the industry. the discount rate assumption. All bonds were denominated in U.S. Dollars, with a minimum outstanding of $50.0 million. This population of bonds was narrowed from a broader universe of over 500 Moody's Aa-rated, non-callable (or callable with make-whole provisions) bonds by eliminating the top 10th percentile and the bottom 40th percentile to adjust for any pricing anomalies and to represent the bonds we would most likely select if we were to actually annuitize our pension plan liabilities. This portfolio of bonds was used to generate a yield curve and associated spot rate curve to discount the projected benefit payments for the domestic plans. The discount rate is the single level rate that produces the same result as the spot rate curve. We establish the long-term asset return assumption based on a review of historical compound average asset returns, both company-specific and relating to the broad market, as well as analysis of current market and economic information and future expectations. The current asset return assumption is supported by historical market experience for both our actual and target asset allocation. In calculating the net pension cost, the expected return on assets is applied to a calculated value on plan assets, which recognizes changes in the fair value of plan assets in a systematic manner over five years. The difference between this expected return and the actual return on plan assets is a component of the total net unrecognized gain or loss and is subject to amortization in the future. In May 2014, the FASB issued Accounting Standards Update ("ASU") No. 2014-09, Revenue from Contracts with Customers, which provides guidance for revenue recognition. This ASU affects any entity that either enters into contracts with customers to transfer goods or services or enters into contracts for the transfer of non-financial assets. This ASU will supersede the revenue recognition requirements in ASC 605, Revenue Recognition, and most industry-specific guidance. This ASU will also supersede certain cost guidance included in Subtopic 605-35, Revenue Recognition-Construction-Type and Production-Type Contracts. In August 2015, the FASB issued ASU No. 2015-14 which deferred the effective date of the new standard by one year so that it will be effective for us beginning June 1, 2018. We will adopt this ASU using the modified retrospective transition method in the first quarter of fiscal 2019. Under this method, we will be required to recognize the cumulative effect of adopting this ASU as of June 1, 2018. We have substantially completed our assessment of the new ASU and are finalizing the quantification of our adoption adjustments as well as preparing the new required disclosures for the first quarter of fiscal 2019. We have identified three areas where the new ASU will impact our revenue recognition. First, we have certain contracts under which we manufacture products with no alternative use and the Company has an enforceable right to payment from the customer. As a result, the Company will be required to record revenue for these contracts over time as opposed to at the time of shipment which is our current policy today. Second, we have contracts under which we perform repair services on customer-owned assets which will also transition to an over time approach compared to our current policy of recognizing revenue at the time of shipment. Third, we have certain contracts in which revenue is recognized using the percentage of completion method over the expected term of the contract. The new ASU will result in the reduction of the contract term used for revenue recognition as certain contracts include unexercised customer option years or include customer rights to terminate the contract without significant penalty. We expect the cumulative effect for the adoption of the new ASU will result in a decrease to retained earnings of approximately $20 million as of June 1, 2018. We will establish new Contract asset and Contract liability balance sheet accounts and will reclassify certain amounts from Accounts receivable, Inventories, Other non-current assets, and Other liabilities and deferred income into these new accounts. In February 2016, the FASB issued ASU 2016-02, Leases. This ASU amends the existing accounting standards for lease accounting, including requiring lessees to recognize most leases on their balance sheets, including those classified as operating leases under the current accounting guidance. In addition, this ASU will require new qualitative and quantitative disclosures about the Company's leasing activities. This new standard will be effective for us beginning June 1, 2019, with early adoption permitted. This ASU requires a modified retrospective transition approach for all leases existing at, or entered into after, the date of initial application, with an option to use certain transition relief. We are in the preliminary phases of assessing the effect of this ASU on our portfolio of leases. While this assessment continues, we have not yet selected a transition date nor have we determined the effect of this ASU on our consolidated financial statements. In March 2016, the FASB issued ASU 2016-09, Improvements to Employee Share-Based Payment Accounting, which amends ASC Topic 718, CompensationStock Compensation. This ASU requires excess tax benefits or deficiencies for share-based payments to be recorded in the period shares vest as income tax expense or benefit, rather than within equity. Cash flows related to excess tax benefits are now included in operating activities and are no longer classified as a financing activity. We adopted this ASU on June 1, 2017 and recognized excess tax benefits of $2.9 million as an income tax benefit in fiscal 2018. We have also presented the excess tax benefits within operating activities in the consolidated statement of cash flows for fiscal 2018. As permitted, we adopted the statement of cash flow presentation guidance on a prospective basis with no adjustments to the previously reported amounts. In March 2017, the FASB issued ASU 2017-07, CompensationRetirement Benefits (Topic 715): Improving the Presentation of Net Periodic Pension Cost and Net Periodic Postretirement Benefit Cost. This ASU requires an employer to report the service cost component of net periodic pension benefit cost in the same line item as other compensation costs for those related employees. Other components of net pension cost, including interest, expected return on plan assets, and actuarial gains and losses are to be presented outside of operating income. This new standard requires retrospective treatment for the classification of pension costs and will be effective for us beginning June 1, 2018. With the majority of our pension plans frozen and total service cost, including administrative expenses, of $2.4 million and $2.5 million in fiscal 2018 and 2017, respectively, this ASU is not expected to have a material impact on our consolidated financial statements. Our exposure to market risk includes fluctuating interest rates under our credit agreements, changes in foreign exchange rates, and credit losses on accounts receivable. See Note 1 of Notes to Consolidated Financial Statements for a discussion on accounts receivable exposure. We are exposed to the risk that our earnings and cash flows could be adversely impacted by fluctuations in interest rates. A 10 percent increase in the average interest rate affecting our financial instruments, including the average outstanding balance of our debt obligations would not have had a significant impact on our pre-tax income during fiscal 2018. Revenues and expenses of our foreign operations are translated at average exchange rates during the year, and balance sheet accounts are translated at year-end exchange rates. Balance sheet translation adjustments are excluded from the results of operations and are recorded in stockholders' equity as a component of accumulated other comprehensive loss. A hypothetical 10 percent devaluation of the U.S. dollar against foreign currencies would not have had a material impact on our financial position or continuing operations during fiscal 2018. We have audited the accompanying consolidated balance sheets of AAR CORP. and subsidiaries (the Company) as of May 31, 2018 and 2017, and the related consolidated statements of income, comprehensive income, changes in equity, and cash flows for each of the years in the three-year period ended May 31, 2018, and the related notes (collectively, the Consolidated Financial Statements). In our opinion, the Consolidated Financial Statements present fairly, in all material respects, the financial position of the Company as of May 31, 2018 and 2017, and the results of their operations and their cash flows for each of the years in the three-year period ended May 31, 2018, in conformity with U.S. generally accepted accounting principles. We also have audited, in accordance with the standards of the Public Company Accounting Oversight Board (United States) (PCAOB), the Company's internal control over financial reporting as of May 31, 2018, based on criteria established in Internal ControlIntegrated Framework (2013) issued by the Committee of Sponsoring Organizations of the Treadway Commission, and our report dated July 11, 2018, expressed an unqualified opinion on the effectiveness of the Company's internal control over financial reporting. These Consolidated Financial Statements are the responsibility of the Company's management. Our responsibility is to express an opinion on these Consolidated Financial Statements based on our audits. We are a public accounting firm registered with the PCAOB and are required to be independent with respect to the Company in accordance with the U.S. federal securities laws and the applicable rules and regulations of the Securities and Exchange Commission and the PCAOB. We have served as the Company's auditor since 1985. AAR CORP. is a diversified provider of services and products to the worldwide commercial aviation and government and defense markets. Services and products include: aviation supply chain and parts support programs; maintenance, repair and overhaul of airframes, landing gear, and certain other airframe components; design and manufacture of specialized pallets, shelters, and containers; airlift services; aircraft modifications and aircraft and engine sales and leasing. We serve commercial, defense and governmental aircraft fleet operators, original equipment manufacturers, and independent service providers around the world, and various other domestic and foreign military customers. The accompanying Consolidated Financial Statements include the accounts of the Company and its majority-owned subsidiaries after elimination of intercompany accounts and transactions. The equity method of accounting is used for investments in other companies in which we have significant influence; generally this represents common stock ownership of at least 20% and not more than 50%. Sales and related cost of sales for product sales are generally recognized upon shipment of the product to the customer. Our standard terms and conditions provide that title passes to the customer when the product is shipped to the customer. Sales of certain defense products are recognized upon customer acceptance, which includes transfer of title. Sales from services and the related cost of services are generally recognized when customer-owned material is shipped back to the customer. We have adopted this accounting policy because at the time the customer-owned material is shipped back to the customer, all services related to that material are complete as our service agreements generally do not require us to provide services at customer sites. Furthermore, serviced units are typically shipped to the customer immediately upon completion of the related services. Sales and related cost of sales for certain large airframe maintenance contracts and performance-based logistics programs are recognized by the percentage of completion method, based on the relationship of costs incurred to date to the estimated total costs. Net favorable cumulative catch-up adjustments recognized during fiscal 2018, 2017, and 2016 were $3.6 million, $8.5 million, and $3.7 million, respectively, resulting from changes to the estimated profitability of these contracts. In June 2016, the U.S. Air Force awarded the new contract for the KC-10 Extender Contractor Logistics Support Program ("KC-10 Program") to a competitor. Our principal services under the prior contract for the KC-10 Program were completed in January 2017; however, we have provided limited services since that date. Sales for the KC-10 Program during fiscal 2018, 2017 and 2016 were $29.1 million, $110.6 million, and $148.1 million, respectively. Gross profit for the KC-10 Program during fiscal 2018, 2017 and 2016 was $4.8 million, $8.7 million, and $16.0 million, respectively. We maintain an allowance for doubtful accounts to reflect the expected uncollectibility of accounts receivable based on past collection history and specific risks identified among uncollected accounts. In determining the required allowance, we consider factors such as general and industry-specific economic conditions, customer credit history, and our customers' current and expected future financial performance. The majority of our customers are recurring customers with an established payment history. Certain customers are required to undergo an extensive credit check prior to delivery of products or services. In accordance with Accounting Standards Codification ("ASC") 350, IntangiblesGoodwill and Other, goodwill and other intangible assets deemed to have indefinite lives are not amortized, but are subject to annual impairment tests. We review and evaluate our goodwill and indefinite life intangible assets for potential impairment at a minimum annually, on May 31, or more frequently if circumstances indicate that impairment is possible. Our annual goodwill impairment test over the last three years has used a combination of the qualitative approach and the two-step quantitative approach to evaluate goodwill for impairment. As of May 31, 2018, we have five reporting units with only four of the reporting units assigned goodwill. Our four reporting units with goodwill include two in our Aviation Services segment (Aviation Supply Chain and Maintenance, Repair, and Overhaul) and two in our Expeditionary Services segment (Airlift and Mobility). We utilized the qualitative assessment approach for all reporting units. We performed the annual qualitative analysis as of May 31, 2018 for the four reporting units with assigned goodwill and concluded it was more likely than not that the fair value of each reporting unit exceeded its carrying value, and thus no impairment charge was recorded. Customer relationships are being amortized over 10-20 years, developed technology is being amortized over 7-15 years, lease agreements are being amortized over 5-18 years, and the FAA certificate is being amortized over 20 years. Amortization expense recorded during fiscal 2018, 2017 and 2016 was $4.7 million, $4.2 million, and $4.4 million, respectively. The estimated aggregate amount of amortization expense for intangible assets in each of the next five fiscal years is $4.1 million in 2019, $3.7 million in 2020, $3.7 million in 2021, $2.9 million in 2022 and $2.3 million in 2023.
at year-end exchange rates. Revenues and expenses are translated at average exchange rates during the year. Translation adjustments are excluded from the results of operations and are recorded in stockholders' equity as a component of accumulated other comprehensive loss until such subsidiaries are liquidated. Cash and cash equivalents consist of highly liquid instruments which have original maturities of three months or less when purchased. Restricted cash represents cash on hand required to be set aside by a contractual agreement related to receivable securitization arrangements. Generally, the restrictions related to the receivable securitization arrangements lapse at the time we remit the customer payments collected by us as servicer of previously sold customer receivables to the purchaser. Financial instruments that potentially subject us to concentrations of market or credit risk consist principally of trade receivables. While our trade receivables are diverse and represent a number of entities and geographic regions, the majority are with the U.S. government and its contractors and entities in the aviation industry. Accounts receivable due from the U.S. government were $33.0 million and $29.4 million at May 31, 2018 and 2017, respectively. We perform regular evaluations of customer payment experience, current financial condition, and risk analysis. We may require collateral in the form of security interests in assets, letters of credit, and/or obligation guarantees from financial institutions for transactions executed on other than normal trade terms. The carrying amounts of cash and cash equivalents, accounts receivable, and accounts and trade notes payable approximate fair value because of the short-term maturity of these instruments. The carrying value of long-term debt bearing a variable interest rate approximates fair value. Fair value estimates are made at a specific point in time based on relevant market information about the financial instrument. These estimates are subjective in nature and involve uncertainties and matters of significant judgment and therefore cannot be determined with precision. Changes in assumptions could significantly affect the estimates. Inventories are valued at the lower of cost or market (estimated net realizable value). Cost is determined by the specific identification, average cost, or first-in, first-out methods. From time-to-time, we purchase aircraft and engines for disassembly to individual parts and components. Costs are assigned to these individual parts and components utilizing list prices from original equipment manufacturers and recent sales history. Lease revenue is recognized as earned. The cost of the asset under lease is the original purchase price plus overhaul costs. Depreciation is computed using the straight-line method over the estimated service life of the equipment. The balance sheet classification of equipment under lease is generally based on lease term, with fixed-term leases less than twelve months generally classified as short-term and all others generally classified as long-term. Equipment on short-term lease includes aircraft engines and parts on or available for lease to satisfy customers' immediate short-term requirements. The leases are renewable with fixed terms, which generally vary from one to twelve months. Future rent due to us under non-cancelable leases during each of the next five fiscal years is $26.2 million in 2019, $25.7 million in 2020, $25.0 million in 2021, $24.5 million in 2022, and $24.5 million in 2023. Rotable assets supporting long-term programs consists of rotable component parts used to support long-term supply chain programs. The assets are being depreciated on a straight-line basis over their estimated useful lives. We record property, plant and equipment at cost. Depreciation is computed on the straight-line method over useful lives of 10-40 years for buildings and improvements and 3-10 years for equipment, furniture and fixtures, and capitalized software. Leasehold improvements are amortized over the shorter of the estimated useful life or the term of the applicable lease. Repair and maintenance expenditures are expensed as incurred. Upon sale or disposal, cost and accumulated depreciation are removed from the accounts, and related gains and losses are included in results of operations. undiscounted cash flows, including demand for our services, future market conditions and trends, business development pipeline of opportunities, current and future lease rates, lease terms, and residual values. We are subject to income taxes in the U.S., state, and several foreign jurisdictions. In the ordinary course of business, there can be transactions and calculations where the ultimate tax determination is uncertain. We recognize deferred tax assets and liabilities for the expected future tax consequences of events that have been included in the financial statements or tax returns in accordance with applicable accounting guidance for accounting for income taxes, using currently enacted tax rates in effect for the year in which the differences are expected to reverse. We record a valuation allowance when necessary to reduce deferred tax assets to the amount expected to be realized. Deferred tax assets are reduced by a valuation allowance if, based on the weight of available evidence, it is more likely than not that some portion or all of the deferred tax assets will not be realized. Both positive and negative evidence are considered in forming our judgment as to whether a valuation allowance is appropriate, and more weight is given to evidence that can be objectively verified. Valuation allowances are reassessed whenever there are changes in circumstances that may cause a change in judgment. The accounting for uncertainty in income taxes requires a more-likely-than-not threshold for financial statement recognition of tax positions taken or expected to be taken in a tax return. Where necessary, we record a liability for the difference between the benefit recognized for financial statement purposes and the tax position taken or expected to be taken on our tax return. To the extent that our assessment of such tax positions changes, the change in estimate is recorded in the period in which the determination is made. During fiscal 2018, treasury stock increased $0.9 million reflecting the repurchase of common shares of $13.1 million, restricted stock activity of $1.0 million and the re-issuance of shares upon exercise of stock options, net of shares withheld to satisfy statutory tax obligations, of $11.2 million. During fiscal 2017, treasury stock increased $12.2 million reflecting the repurchase of common shares of $19.8 million, restricted stock grants of $1.3 million and the re-issuance of shares upon exercise of stock options, net of shares withheld to satisfy statutory tax obligations, of $8.9 million. During fiscal 2016, treasury stock increased $21.3 million reflecting the repurchase of common shares of $18.8 million, restricted stock grants of $4.8 million and the re-issuance of shares upon exercise of stock options, net of shares withheld to satisfy statutory tax obligations, of $2.3 million. We have made estimates and utilized certain assumptions relating to the reporting of assets and liabilities and the disclosures of contingent liabilities to prepare these Consolidated Financial Statements in conformity with accounting principles generally accepted in the United States. Actual results could differ from those estimates. In February 2018, the FASB issued ASU 2018-02, Income StatementReporting Comprehensive Income (Topic 220): Reclassification of Certain Tax Effects from Accumulated Other Comprehensive Income. This ASU permits the reclassification of tax effects stranded in accumulated other comprehensive income to retained earnings as a result of the Tax Cuts and Jobs Act (the "Tax Reform Act"). This new standard will be effective for us beginning June 1, 2019 with early adoption permitted. We are currently evaluating the impact of this new standard on our consolidated financial statements. During the third quarter of fiscal 2018, we decided to pursue the sale of our Contractor-Owned, Contractor-Operated ("COCO") business previously included in our Expeditionary Services segment. Due to this strategic shift, the assets, liabilities, and results of operations of our COCO business have been reported as discontinued operations for all periods presented. Goodwill was allocated to this business based on its relative fair value to the reporting unit. The fair value of the reporting unit was determined based on a combination of the expected net proceeds upon sale and a discounted cash flow analysis. As the fair value of the COCO business was below its carrying value, a goodwill impairment charge of $9.8 million, representing the estimated loss on disposal, was recorded in the third quarter of fiscal 2018. Our COCO business completed certain contracts in the second quarter of fiscal 2018. As the aircraft supporting these contracts were not placed on new contracts combined with the continued decline in operational tempo within the U.S. Department of Defense ("DoD") and an excess supply of aircraft assets in the market, we determined there was an impairment triggering event and tested the recoverability of our COCO assets. As a result, we recognized impairment and other charges of $54.2 million in the second quarter of fiscal 2018. The fair value of the aircraft and related assets was based on available market data for similar assets. In the first quarter of fiscal 2016, we recognized a gain of $27.7 million net of expenses representing the receipt of the contingent consideration related to the sale of our Telair Cargo Group. Discontinued operations also includes the results of our former metal machining operation which was shutdown in the first quarter of fiscal 2017. During the third quarter of fiscal 2016, we recognized $2.8 million of income tax expense in discontinued operations related to changes in estimates associated with tax provision to federal income tax return filing differences. During the fourth quarter of fiscal 2017, we recognized an income tax benefit in discontinued operations of $6.7 million for an effective settlement of a previously reserved tax position. On February 23, 2018, we entered into a Purchase Agreement with Citibank N.A. ("Purchaser") for the sale, from time to time, of certain accounts receivable due from certain customers (the "Purchase Agreement"). Under the Purchase Agreement, the maximum amount of receivables sold is limited to $150 million. The term of the Purchase Agreement runs through February 22, 2019, however, the Purchase Agreement may also be terminated earlier under certain circumstances. The term of the Purchase Agreement shall be automatically extended for annual terms unless either party provides advance notice that they do not intend to extend the term. During fiscal 2018, we sold $239.6 million of receivables under the Purchase Agreement and remitted $167.9 million to the Purchaser on their behalf. As of May 31, 2018, we have collected cash of $10.5 million which has not yet been remitted to the Purchaser and has been classified as Restricted cash on our Consolidated Balance Sheet. During fiscal 2018, we incurred purchase discount and other fees of $0.9 million which are recognized as Other expenses on our Consolidated Statements of Income. At May 31, 2018, our variable rate and fixed rate debt had a fair value that approximates its carrying value and are classified as Level 2 in the fair value hierarchy. On October 18, 2017, we entered into a Credit Agreement with the Canadian Imperial Bank of Commerce, as lender (the "Credit Agreement"). The Credit Agreement provided a Canadian $31 million term loan with the proceeds used to fund the acquisition of two maintenance, repair, and overhaul ("MRO") facilities in Canada from Premier Aviation. The term loan is due in full at the expiration of the Credit Agreement on November 1, 2021 unless terminated earlier pursuant to the terms of the Credit Agreement. Interest is payable monthly on the term loan at the offered fluctuating Canadian Dollar Offer Rate plus 125 to 225 basis points based on certain financial measurements if a Bankers' Acceptances loan, or at the offered fluctuating Prime Rate plus 25 to 125 basis points based on certain financial measurements, if a Prime Rate loan. On November 1, 2016, we entered into an amendment to our Revolving Credit Facility which extended the maturity of the Revolving Credit Facility to November 1, 2021, eliminated the condition of no material adverse change for credit extensions and modified certain other provisions. Our financing arrangements also require us to comply with leverage and interest coverage ratios, maintain a minimum net working capital level, and comply with certain affirmative and negative covenants, including those relating to financial reporting and notification, payment of indebtedness, cash dividends, taxes and other obligations, compliance with applicable laws, and limitations on additional liens, indebtedness, acquisitions, investments and disposition of assets. The Revolving Credit Facility also requires our significant domestic subsidiaries, and any subsidiaries that guarantee our other indebtedness, to provide a guarantee of payment under the Revolving Credit Facility. At May 31, 2018, we were in compliance with the financial and other covenants in our financing agreements. We also have $9.9 million available under foreign lines of credit. We have granted stock-based awards under the AAR CORP. 2013 Stock Plan (the "2013 Stock Plan") and the AAR CORP. Stock Benefit Plan ("Stock Benefit Plan") each of which has been approved by our stockholders. No further awards will be made under the Stock Benefit Plan. Under the 2013 Stock Plan, we are authorized to issue stock options to employees and non-employee directors that allow the grant recipients to purchase shares of common stock at a price not less than the fair market value of the common stock on the date of grant. Generally, stock options awarded expire ten years from the date of grant and are exercisable in three, four or five equal annual increments commencing one year after the date of grant. In addition to stock options, the 2013 Stock Plan also provides for the grant of time-based restricted stock awards and performance-based restricted stock awards. The number of performance-based awards earned, subject to vesting, is based on achievement of certain Company-wide or segment financial goals or stock price targets. The 2013 Stock Plan also provides for the grant of stock appreciation units and restricted stock units; however, to date, no such awards have been granted. Restricted stock grants (whether time-based or performance-based) are designed, among other things, to align employee interests with the interests of stockholders and to encourage the recipient to build a career with us. Restricted stock typically vests over periods of one to five years from date of grant. Restricted stock grants may be performance-based with vesting to occur over periods of three to five years. All restricted stock that has been granted and, if performance-based, earned according to performance criteria carries full dividend and voting rights, regardless of whether it has vested. inception, a total of 11,149,000 shares have been granted under the Stock Benefit Plan. We have granted a total of 2,669,000 shares under the 2013 Stock Plan. All future stock awards will be made under the 2013 Stock Plan. There were 2,128,238 shares available for grant under the 2013 Stock Plan as of May 31, 2018. The risk-free interest rate is based on the U.S. Treasury yield curve in effect at the time of grant. The expected volatility is based on historical volatility of our common stock, and the expected option term represents the period of time that the stock options granted are expected to be outstanding based on historical exercise trends. The dividend yield represents our anticipated cash dividends at the grant date over the expected option term. $1.2 million, and $0.2 million, respectively. Expense recognized in selling, general and administrative expenses for stock options during fiscal 2018, 2017, and 2016 was $5.1 million, $4.6 million, and $3.5 million, respectively. As of May 31, 2018, we had $4.6 million of unrecognized compensation expense related to stock options that will be amortized over an average period of 0.7 years. We provide executives and other key employees an opportunity to be awarded performance-based and time-based restricted stock. The performance-based awards are contingent upon the achievement of certain performance objectives, including cumulative net income and average return on capital over a three-year performance period. During fiscal 2018, 2017, and 2016, we granted 108,440, 212,583, and 119,929 of performance-based restricted shares, respectively. Time-based restricted shares of 24,425, 39,100, and 42,557 were granted to executives and key employees during fiscal 2018, 2017, and 2016, respectively. We also award time-based restricted stock to our non-employee directors as part of their annual compensation. Time-based restricted shares of 55,000, 50,625, and 47,083 were granted to members of the Board of Directors during fiscal 2018, 2017, and 2016, respectively. The fair value of restricted shares is the market value of our common stock on the date of grant. Expense recognized in selling, general and administrative expenses for all restricted share programs during fiscal 2018, 2017, and 2016 was $10.2 million, $6.4 million, and $3.2 million, respectively. As of May 31, 2018 we had $4.1 million of unearned compensation related to restricted shares that will be amortized to expense over a weighted average period of 2.5 years. On December 22, 2017, the Tax Reform Act was enacted which significantly revised the U.S. corporate income tax system. The Tax Reform Act, among other things, reduced the current corporate federal income tax rate to 21% from 35%, changed bonus depreciation regulations and limited deductions for executive compensation. The income tax rate reduction in the Tax Reform Act is effective January 1, 2018 which results in a blended federal statutory tax rate of 29.2% in fiscal 2018. We re-measured our deferred tax assets and liabilities based on the tax rate at which they are expected to reverse in the future, which is either at a federal rate of 29.2% for reversals in fiscal 2018 or 21% for reversals in fiscal 2019 and subsequent years. During the third quarter of fiscal 2018, we recognized an income tax benefit of $13.0 million for the re-measurement impact on a provisional basis as permitted under Staff Accounting Bulletin No. 118, which allows the use of a measurement period, similar to that used in business combinations, to account for the impacts of the Tax Reform Act. In the fourth quarter of fiscal 2018, we completed our assessment and recognized an additional income tax benefit of $1.1 million resulting in a total income tax benefit of $14.1 million in fiscal 2018 for the re-measurement impact.